The painting is the cartoon designed for the bezel west of the vestibule of the chapel. 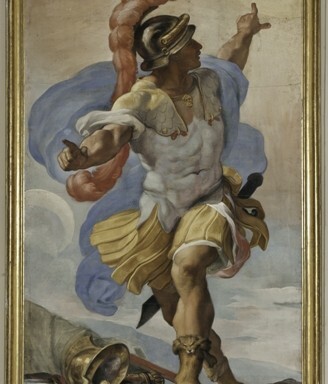 Joshua, the ancient Hebrew commander, son of Nun and Moses’ successor as leader of Israel, is shown stopping the sun with one arm and the moon with the other. This moment is described in the Bible: “It was then, on that day, when Amorites fled before the children of Israel and Joshua spoke to the Lord, and in the sight of all the people said: ’Sun, do not move from Gabon and thou, Moon, from the valley of Aijalon. And the sun and the moon halted until the nation was avenged of her enemies”(Joshua 10: 12-13). Read more about this painting and it’s restoration needs.